The Paymash Bundle includes everything you need to get started in your shop, restaurant or beauty salon. Sign up for a free consultation. The hardware package has been compiled for the highest demands of a POS system and is suitable for all industries. 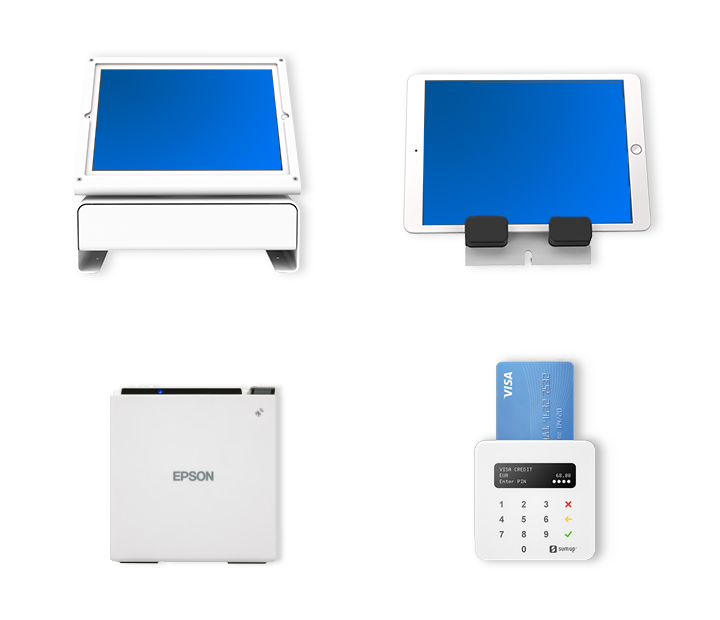 It includes receipt printer, cash drawer, card terminal and two tablets, which you can use as a stationary cash register or customer display. Paymash partnered with Grenke to provide the paymash hardware bundle. The minimum term is 24 months. The hardware could be taken over for about 159.- plus VAT. There are two variants of the package available. Billing takes place quarterly and is handled by our partner GRENKE. The contract must be terminated, otherwise it will automatically renew after two years! The hardware must be verifiably insured. Can I keep the hardware after 24 months? After 24 months, you can take over the hardware for a remainder of 159.- excl. VAT or renew your contract. Can I extend the Paymash license during the leasing period? You can upgrade your Paymash license at any time. You can simply add additional employees, branches or even an online store in your settings. Who is entitled to benefit of the hardware bundle? Only companies and businesses can apply for the complete package. Individuals are unfortunately excluded. How can I order the hardware bundle? Fill out the form below to request the bundle leasing offer. After you have passed the background check successfully, you will receive a contract sent by mail. Sign and return the contract. You may want to already start setting up your Paymash account. You can test Paymash for free during 14 days. For hardware support inquiries, please contact the manufacturer directly. For all questions about Paymash we are happy to help you.